Want to add colour to your fog effect? No problem! Now you can with the Antari Z-1520 Coloured LED Fog Machine! The Antari Z1520 combines the dramatic effect of RGB LED lighting with a high output vertical smoke machine to produce stunning plumes of coloured fog. Controlled by either the included wireless remote control or on board DMX, the Z1520 adds a new dimension to events, shows, or productions. Also great for parties and any event where you want to add some fun coloured special FX to the mix! 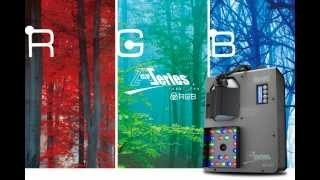 This coloured led fog machine for hire can satisfy desires for both spectacular fog and lighting effects at the same time. Antari is a world leading atmospheric effect company that specialises in smoke, haze, fog and bubble machines so you know it is premium quality and reliable. Not sure if this is the machine for you? No worries! Why not browse our range of smoke machines, haze machines, low fog machines and other special FX. Add some coloured FX lights from only $22! We offer a delivery, set up and pack down service if required. Simply let us know when contacting us about the booking and we can arrange a quote for you.